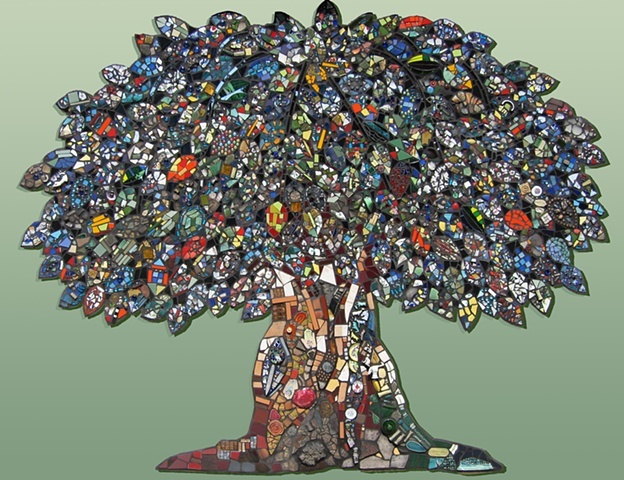 I have made art throughout my life and my latest love for the past 10 years has been mosaics. This art form is both mesmerizing and frustrating but the resulting pieces are endlessly fascinating. I learned the skill of public mural-making through apprenticeship and assisting other, more advanced, mosaic muralists. As a graphic designer for over 30 years I enjoy the practical application of art - that's what has drawn me to creating public mosaics. They will last! My fine art mosaics explore the use of light. They can be seen at their best in low light where the full range of color glints and sparkles and never offers the same look twice, during a day, month or year. Photography can't do them justice. They must be lived with day to day to experience them to their fullest. I invite you to also explore my blog and Flickr site, as they will often display different mosaics than are shown here. All the art on this site is the property of me, the artist, and can only be used or reproduced with my written permission.